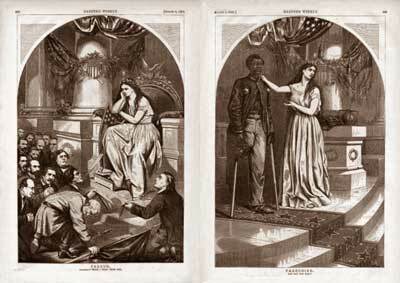 Political Cartoon from the 1860’s entitled “Franchise” about the dilemma faced: amnesty and restored voting rights for former confederate leaders on the left, or the voting franchise for African-American Union soldiers on the right. If anyone is interested Ta-Nehsi Coates at The Atlantic online is moderating an awesome online book discussion of Eric Foner’s book “Reconstruction” which really is the absolute best thing out there on this period. It’s happening on July 25th, and then Fridays Aug 3, 10, & 17… (each day is 3 chapters but the discusion is free-flowing and often goes into modern politics too!). I’ll be participating! In a sense the ongoing discussions over at The Atlantic this year have usurped my original plan to do a longer series on Reconstruction and the interpretations (and myth-making) of it that followed. The discussion there is excellent. I still am working on piece about the Reconstruction sections of Gone with the Wind, but the actual Reconstruction debates have defintely moved over there for me. While I’m at it, let me also pimp Eric Foner’s newer book about Lincoln’s evolving views on slavery and African-Americans. It’s superb. I have “Give Me Liberty” volumeII by Foner. It’s been a good starter survey for post Civil War.